The team at LK Translations participates in regular day-long training sessions in-house, scheduled several times a year and designed specifically for honing skills in areas including writing style, time management and research. Recognising the huge success these team days have had in the past, and aware that our team has now expanded to include several freelance suppliers, in October we decided to take our training outside the office and open it up to both the internal and external members of our team. 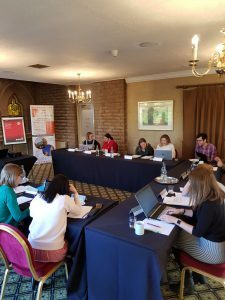 The venue itself was a change from previous team days too: the conference facilities at the Mercure Norton Grange hotel in nearby Rochdale provided the perfect setting for the day of presentations, workshop exercises and, of course, chatting over coffee. After a round of introductions, Senior Translator Jenny Pettet kicked off the morning’s proceedings with an engaging presentation on Industry 4.0 and the Internet of Things – including a series of quiz questions that ensured everyone was wide-awake! Working in groups, the participants then set about translating a text on this subject. As translators in technical fields, we know how important it is to not only produce high-quality language, but also stay abreast of the latest developments in technology and industrial sectors – so this session was a welcome boost to our subject-specific knowledge. After a short coffee break, it was time for the next session, this time held by Lead Translator Siobhan Gorrie. Punctuated by games and exercises, this presentation focused on reference materials – where to find them, how to use them, and how to ensure that what you’re using is reliable. The session also provided an opportunity for participants to share their knowledge by contributing their own examples of good reference materials they use in their working lives. No team day is complete without a decent lunch, and during our well-earned break we had more chances to discuss the day so far and catch up with one another. Then it was back for the final session: led by Senior Translator Catherine Entwistle, it focused on customer feedback and how to handle the various scenarios in which translators might find themselves dealing with it. The session included several talking points and everyone agreed that, no matter how experienced a translator you are, it is crucial to know how to deal with feedback and how to manage the time involved in doing so. Once the day’s formal proceedings had wrapped up, there was just time for a group photo before everyone headed their separate ways. Our suppliers are located in various parts of the country and we are extremely grateful to them for making the journey to see the LK Team in person! And returning to the subject of feedback for a moment, we were delighted with the comments we received afterwards – see below for a few examples. We hope that this will be the start of many more joint team days to come!